Usborne books were a great childhood favorite when it came to pretty much anything. They were filled with cool drawings and the way they visually showed how things worked was a great way to teach all kinds of fascinating stuff for kids (and adults for that matter). When it came to computing, they were a great resource to coming to grips with all that new technology! 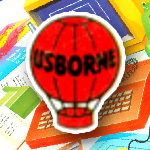 Recently, it seems Usborne have released a pile of their old 80's computing books on their site for download in PDF format, as part of promoting some of their new books. After a look, there are certainly a few that I recall reading back then. What made these books so great? Just what wasn't there to like about these books!? Usborne had a good understanding of how to approach education for a broad audience. What they did was use vibrant colour, artwork and simple language. They made the books fun, which when learning something technical or challenging such as computing is very important. In many of the computer programs that were listed in these books, a break down next to the code would explain in clear non-technical terms just what the line of code did. Usborne always did a great job of making it easy to understand the complex concepts. I did eventually learn to write machine code, but it was mostly through reading code, scratching my head and then reaching an epiphany while sitting one day on a school bus where it all just suddenly made a lot of sense. There were so many computers around (ZX81, ZX Spectrum, C64, VIC20, BBC, Atari, etc, etc) and because they all had their own dialects of the BASIC programming language, it meant that the book market was loaded with specific texts dedicated to one machine or another. Usborne were fairly smart in this area in quite a few of their books. They kept their programs simple enough to be translatable across platforms, and they even added notes on how to change the program to work on the other computers of the time. Making a program work for your own computer, even with the guides, was a great learning challenge and a way to really grasp the concepts and problem solving techniques that are the basis of programming and logic. One of the other great things was the way that the books not only educated, but they also challenged kids (and adults - lets not just assume these books were read by 10-11 year olds) to think about what it is they were learning. Throughout most of the programs were small puzzles and suggestions for kids to try, things like asking how a game could be made harder, or how to get the computer to ask for more options. The answers to these puzzles were always found at the back of the books, which of course meant you weren't stuck trying to do something without a solution to teach you the way you could do it. You can check out these great historical computing resources on their website here (on the right of the page). Their new books are really not that indifferent to what they were in the 80's. Obviously the art style has changed a little from the hand-drawn doodles to what now look like crisp vector illustrations, but the way in which they present and explain is just as much fun as it was back then. Read, and enjoy... And share it with your kids (if you have them) although it might be tricky dragging them away from their Playbox x-station to learn 30+ year old computing.